Altitude : 26.90 mts. above sea level. Languages : Hindi, Avadhi & English. Clothing : Light cotton in summer.Woollen in winter. On the right bank of the river Ghagra or Saryu, as it is called within sacred precincts, on latitude 26° 48’ north and longitude 82°13’ east in north India, stands the holy city of Ayodhya, believed to be the birth place of Lord Rama, the Seventh incarnation of Lord Vishnu. Manu, the lawgiver of the Hindus, founded the ancient city of Ayodhya, according to the Ramayana. For centuries it was the capital of the descendants of the Surya dynasty of which Lord Rama was the most celebrated King. 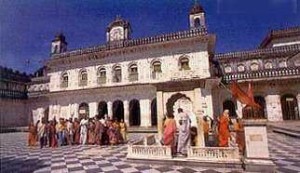 Ayodhya during ancient times was known as Kosaldesa. The Atharvaveda describes it as “a city built by Gods and being as prosperous as paradise itself”. Ayodhya is pre-eminently a city of temples yet, all the places of worship here, are not only of Hindu religion, At Ayodhya several religions have grown and prospered simultaneously and also at different periods of time in the past. Remnants of Hinduism, Buddhism, Jainism and Islam can still be found in Ayodhya. According to Jain tradition, five Tirthankar as were born at Ayodhya,including Adinath the 1st Tirthankar. Some other places of interest are Guptarghat, Rajghat, Ramghat, Lakshmanghat, Janakighat,Nayaghat, Sitakund, Suryakund, Vibhishankund, Brahmakund,Daturvan,Vidhyakund,Sugreev Tila,Angad Tila, Nal-neel Tila, Kuber Tila and Mani Parvat. Dinning out options at Ayodhya, are limited to local eateries/dhabas, which offer largely vegetarian food. Good restaurants and hotels are available at Faizabad town just 7 km from Ayodhya. Air: For Ayodhya the nearest airports are Amausi (Lucknow 134 km), Bumrauli (Allahabad 166 km) and Babatpur (Varanasi 209 km). Rail: Ayodhya is situated on the broad gauge Northern Railway line on Mughalsarai-Lucknow main route. Ayodhya / Faizabad are connected to various part of the country through rail. Road: Connected by road to several major cities and town. Some of the major road distances are Lucknow 134 km, Gorakhpur 132 km, Jhansi 441 km, Allahabad 166 km, Sravasti 109 km, Varanasi 209 km, Gonda 51 km. Ramkot: The chief place of worship in Ayodhya is the site of the ancient citadel of Ramkot, which stands on an elevated ground in the western part of the city. Although visited by pilgrims throughout the year, this sacred place attracts devotees from all over India and abroad, on ‘Ramnavami’, the day of the Lord’s birth, which is celebrated with great pomp and show, in the Hindu month of Chaitra (March-April). The Hanuman Garhi: Situated in the centre of the town, this temple is approachable by a flight of 76 steps. Legend has it that Hanuman lived here in a cave and guarded the Janambhoomi or Ramkot. The faithful believe that all their wishes will be granted with a visit to this holy shrine, A massive structure in the shape of a four sided fort with circular bastions at each corner houses a temple of Hanuman and is the most popular shrine in Ayodhya. Treta-ke-Thakur: The temple stands at the place where Rama is said to have performed the Ashvamedha Yajnya. This temple was built about 300 years ago. Initial idols in black sandstones where recovered by Saryu and placed in the new temple, famous as Kaleram-ka-Mandir. Nageshwarnath Temple: The temple of Nageshwarnath is said to have been established by Kush the son of Rama. It is said that this has been the only temple to have survived till the time of Vikramaditya, the rest of the city had fallen into ruins and was covered by dense forests. It was by means of this temple that Vikramaditya was able to locate Ayodhya and the sites of different shrines here. The festival of Shiv Ratri is celebrated here with great pomp and splendour. Kanak Bhawan: Legends have it that Rani Kaikey had built it for Sita. Subsequently it has been restored time and again by various kings. Rani Krishnabhanu Kunwari of Orchha built the present temple in 1891. Maniparvat: Stands about 60 ft. heights, and some scholars think it to be of Buddhist origin. According to legend, it was while Hanuman was carrying the hill bearing the Sanjavini herb for Lakshman’s wounds from Himalayas on way to Lanka, a portion broke off and fell in Ayodhya and this that very mount. Jain Shrines: There are also several Jain temples as Ayodhya, as it is said to be the birthplace of five Tirthankaras Kesari Singh, the treasure, of Nawab Faizabad, built five shrines to mark the birthplace of these Tirthankaras, which bear the date of Vikram Samvat 1781. The temple of Adinath is near the Swargdwar, while the Anantanath temples stands on the Gola Ghat and Sumantnath shrine is at Ramkot. Tulsichaura: The Hindu version of the epic Ramayana, “The Ramcharitmanas” is said to have been composed by Tulsidas, here. Tulsi Smarak Bhawan: Built in memory of the poet Goswami Tulsidas, this monument is used for prayer meetings, religious sermons and discussions, and the singing of devotional songs. It also houses the Ayodhya Shodh Sansthan where a large collection on literally works of Swami Tulsidas can be seen. A cultural centre of performing arts, also functions here. Ramkatha Museum: Ramkatha Museum, set up at Ayodhya since 1988, in engaged in collection, preservation and conservation of antiquities related to the story of Rama. This entry was posted in Ayodhya, Uttar Pradesh and tagged Historical Place, Holy Place. Bookmark the permalink.